Todd recently secured approval for an additional 932 multifamily units, 191,000 square feet of retail/restaurant and 292,000 square feet of office uses in Downtown Columbia. In one matter, Todd worked with The Howard Research And Development Corporation to secure Final Development Plan approval for 509 units and 450,000 square feet of commercial uses within the Lakefront Core Neighborhood. The approved development includes demolition of existing improvements, including the 117,000 square foot American City Building, and is a part of the Howard Hughes Corporation’s 30-year plan to revitalize Downtown Columbia. As part of the approval, Todd was able to secure an increase in maximum building heights from 9 to 15 stories and the extension of a critical street connection. In a separate matter, Todd secured Site Development Plan approval for an additional 423 multifamily units and 60,000 square feet of retail/restaurant space within Area 3 of the Merriweather District, located adjacent to the renovated Merriweather Post Pavilion. 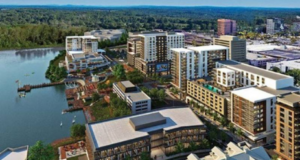 This approval brings the Area 3 approved site plan totals to 805 multifamily units and 480,000 square feet of commercial space. Construction of the first 382 units, a 338,000 square foot office tower, 80,000 square feet of retail/restaurant space and a 1,349-space parking garage is underway.